How many yards of fabric which is 45" wide for a lined cope and humeral veil? I stumbled upon your lovely website. I have to make a cope and humeral veil. I want it to be lined. 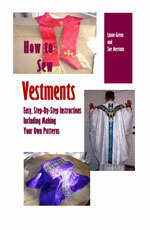 The fabric is silk on both sides and is 45 inches wide. How many yards will I need? Thank you so very much and God bless. Comments for How many yards of fabric which is 45" wide for a lined cope and humeral veil? Now double that number. You will need to cut two pieces of fabric that length. For example, if you need a cope that is 50 inches long, cut two pieces of fabric that are 100 inches long. Stitch those two pieces together so that you have a large, rectangular piece that is 90 inches wide by 100 inches long. Next, you will need to make a neck hole in the center of your fabric. Trim the sides of your piece until it is a large circle. Then you can cut the front opening and add trim. You can get decorative chain here. If you do it this way, you will need about six yards of fabric.